Having read about our road trip to Nova Scotia and Prince Edward Island, James Power – one of the island’s leading oyster growers – invited us to the Raspberry Point Oyster festival on August 21st. When I told James that we would be exploring the Fundy Coast that weekend, he offered to personally show us around during our stay on Prince Edward Island. James and Scott Linkletter run Raspberry Point Oysters. Their small farm is on New London Bay, bordering Prince Edward Island National Park on the island's north shore. The two also grow Pickle Point and Shiny Sea oysters, and as you can see from the video, they have fun doing it. 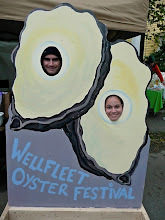 Since the oysters are exclusively distributed in the United States by American Mussel Harvesters, I contacted sales representative Matt DiMatteo for some inspiration. To assist me in my research for the road trip, Matt shipped an assortment of oysters Michael and I would encounter on our road trip: Raspberry Points, Pickle Points, Shiny Seas and Canada Cups from Prince Edward Island, and Cape Bretons from Nova Scotia. For good measure Matt sent along some oyster knives made specifically for American Mussel Harvesters. The knives are available online by clicking here. My friend Don Todorich, a REALTOR who, in a previous life managed food and beverage services at one of Palm Beach’s private clubs, hosted our poolside sampling at his home. I invited two native Alabamans – Tim Horn and David McRoy – in the hopes that the taste of North Atlantic oysters would take their minds off the devastation occurring to the oyster beds along their beloved Gulf shores. Rounding out our group Scott Simmons, Managing Editor of the Coastal Star. To accompany the oysters, we had several bottles of Veuve Clicquot, along with a 2008 Domaine Pinot Gris from Oregon’s King Estate and a 2008 Robert Mondavi Private Selection Sauvignon Blanc. Since I recently received my Oyster Aficionado Certificate of Achievement before we began shucking, we drank and toasted to Richard D. Rush, Professor of Edible Oysters and Editor in Chief of the Oyster Information Newsletter who awarded the certificate. Don had made his famous mignonette, which he had let standing at room temperature overnight, as well as a standard red sauce with horseradish. While I prefer my North Atlantic oysters totally naked, my friends assured me that both sauces worked perfectly. Together we spent a wonderful Florida night shucking and slurping these perfectly salty oysters from points North. The exceptionally sweet Raspberry Points had just the right amount of salt, as did the plump Shiny Seas, which also had a distinct sweet finish. The oyster liquor surrounding the fat Pickle Points brought me back to my childhood days, swimming in the salty waters off northern New England’s beaches, taking in more water than I should have. The beautifully formed Canada Cups were a touch less briny, but still incredibly flavorful. We found the Cape Bretons from Nova Scotia firm meat to have taken in less salt than those from Prince Edward Island. After the last of the oysters and wine was finished, I called Josh, Owner of Go Shuck An Oyster, on Skype to pose a question asked by Don. So, thanks to James and Scott for growing such great oysters, and for American Mussel Harvesters for teasing us tonight. Michael and I are look forward to spending time in New London Bay next month, taking in all things oyster. Quite an exquisite experience I might add and to reconnect with the shucking (not since my childhood) too was totally a bonding experience with my Oyster loving buds. Hey life in South Florida can be good.